Taking babies and young children on road trips and adventures is a great way to break the routine of being at home and it provides them with experiences and stimulation that they would not have been able to get at home. Travelling in the car works well when children need a rest and it is a good opportunity for them to sleep or have some quiet time. After a few hours in the car, take a break so the kids can run and expel some energy while the driver can have a rest. To keep the kids entertained, I would have a bag of toys in the front and gradually pass them back. Once they got bored with one toy and threw it away, I would pass another back until the toy bag was empty. This would always fill in a good half an hour and when we stopped for a break, I would recover all the toys and slowly pass them back when we started driving again. There are a great range of products you can buy which are designed to get your baby into the action such as child carriers and porta cots that have full fly screens. We found the carriers and porta cot invaluable on our trips as we could do hikes with the kids on our backs. 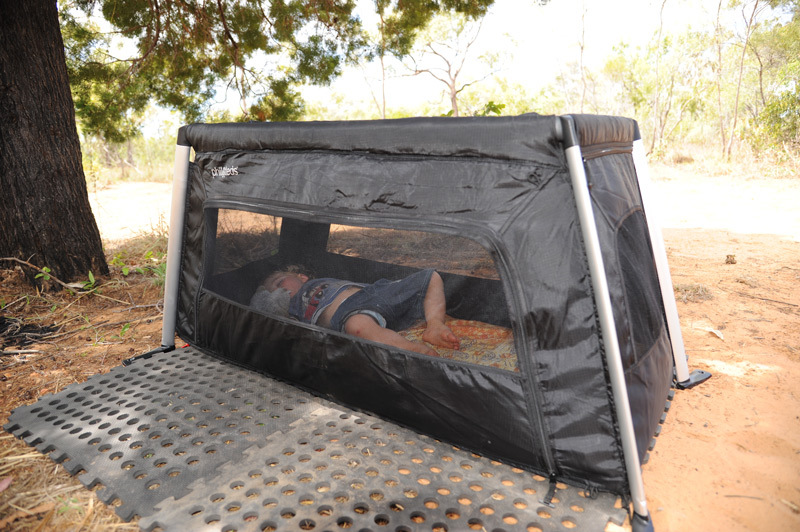 During naptime, we could set the cot up under a cool tree for them to have a sleep and know they were safe from creepy crawlies as they were protected by the fly screen. Whilst it is good to get young children outdoors, we were always careful not to take them on rough four wheel drive tracks that were too bumpy or remote until they were old enough to do so. As children get older, the more they can do and travelling becomes easier as they are increasingly independent and able to complete hikes and more physically demanding activities. With the invention of iPads, games and videos, it has become easier to keep kids entertained for long car trips. After all, reading, colouring in and games of car cricket and eye spy can only last so many hours. The rule on our trips is that electronic devices can be used for a certain time whilst travelling but they don’t leave the car as once we are at our destination as there is always plenty of fun to be had. Our kids all have a UHF radio each (not a toy one but a medium quality radio which works well) so if they want to go off exploring, they can. We ensure there are no imminent dangers, as I wouldn’t let them explore independently if we were camping near a steep cliff, running water or in crocodile country. The kids know not to go too far and to stay together but it still provides them with enough freedom to go further than the campsite and be responsible. As we live in a city with lots of traffic, the kids are unable to explore too far from home but when we go camping, it is a great opportunity to enable much needed independence and freedom. If they have their radios, I can easily call them to see where they are and they can get in touch with me if they have any problems. We plan trips around what we want to do as a family but we also factor in what the kid’s interests are. At the moment they love mining so have done a few trips to locations where they can dig around in the dirt looking for rocks and crystals. Although our boys are growing up and their interests change, they still use their imagination to create games and adventures and they still love playing in mud just as much as when they were little.